Safer. Less expensive. Innovative. These are the three main reasons most consumers use energy-efficient space heaters in their homes. However, there are much more globally important reasons to opt for alternative, energy-efficient space heating solutions. The six products listed below possess a host of features and benefits that any consumer will value for making their homes warmer and more comfortable. But even more importantly, they will help cut down on power plant usage and contribute to avoiding the severe and irreparable environmental problems outlined above. This product is a flat panel space heater that can be easily mounted to the wall under a home office desk. Unlike traditional space heaters, Cozy Legs actually reduces fire risks, and it can be placed against combustible materials without being considered a fire hazard. It also saves money on energy bills. In fact, this revolutionary space heater uses 1/10 the amount of the electricity of a traditional space heater (150 watts versus 1,500 watts), making it the perfect addition to any home office. Cozy Toes is a heated mat that conveniently rolls up for when it is not needed. This unique heating mat uses 95 percent less electricity than a traditional space heater and is ideal for a cold garage area, like a personal workshop table, or any area with a hard, uncarpeted floor. Eco-Save operates like a traditional space heater but only uses half the amount of energy. The Eco-Save Heater also features a built-in safety mechanism that turns the unit off, should it be accidentally knocked over. The heater can be used under desks, on desktops, shelves, and in bathrooms and corners. All you need is an outlet for this heater to add extra warmth to any personal home space area. Foot Warmer is a rubber mat that doubles as a foot warmer, mainly used for melting ice and snow off of footwear. Also, Foot Warmer toasts your feet while you’re still wearing your shoes or boots. This product heats up to 130 degrees Fahrenheit but only uses the amount of energy required to light a standard light bulb. *NOTE: This product is for use on hard, cold surfaces such as cement, tile, stone, and other hard, impervious flooring. It is not recommended for direct use on carpet, hard wood, linoleum, or other delicate surfaces. Functioning just like the Foot Warmer above, the Super Foot Warmer has much larger dimensions. The specs on this product are 36.25″ L x 16″ W x 0.25″ thick. The regular Foot Warmer above is only 20.5″ L x 13.5″ W x 0.25″ thick. The Super Foot Warmer, hence, can be used in larger areas such as living rooms or kitchens (again, not recommended for direct use on carpet, hard wood, linoleum, or other delicate surfaces). 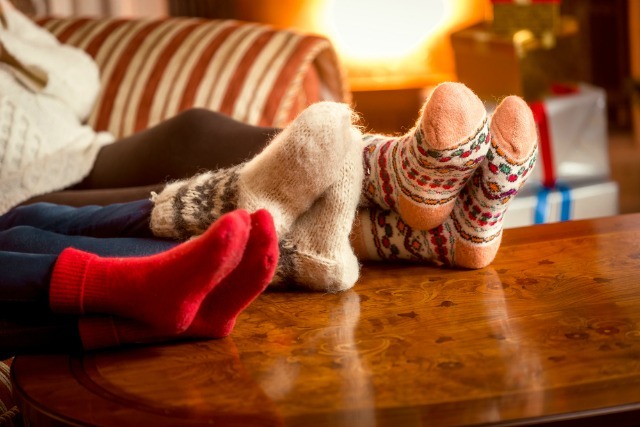 Toasty Toes is ergonomically designed for the elevation and warmth of your feet. It uses 90 percent less energy than a standard heater and also serves as a footrest. Toasty Toes is safe to the touch and features three adjustable positions to customize your comfort experience. The best part about this product is that it improves circulation and blood flow, which is especially beneficial for the elderly and those who suffer from cyanosis. You can even special order a fleece accessory—a fleece-lined pouch that allows maximum comfort for your shoeless feet. Ellen Borza is the content developer for Cozy Products, which provides energy-efficient, low-wattage personal heaters that conserve energy, prevent circuit overloads and reduce fire risk. This post was generously sponsored by Cozy Products.